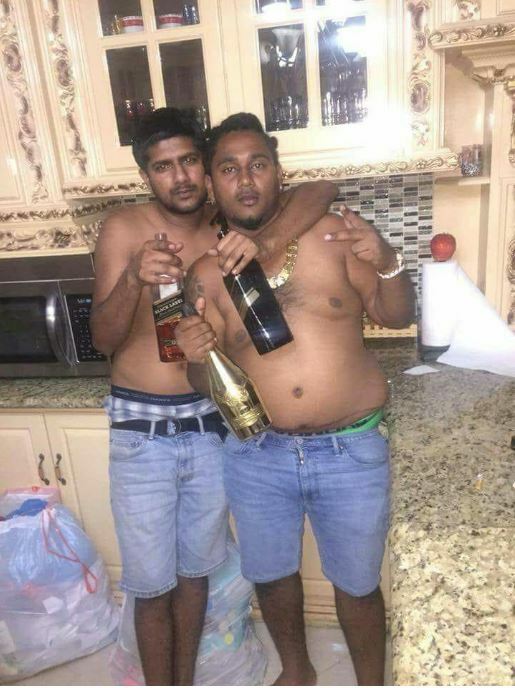 Philip Bassant, left, and his brother-in-law Sheron Sukhdeo enjoying the good times before their murders. Bassant was gunned down yesterday, and Sukhdeo was shot dead on March 26. Bassant's killing, according to senior police within the Central Division, is being linked to the deaths of Joshua Plaza and Sukhdeo. According to senior police sources, the reports of a white car passing and a shooter coming out killing Sukhdeo were false and Bassant and Plaza played critical roles in Sukhdeo's death. Sukhdeo was gunned down on March 26 while at the home of his in-laws. He was cremated a few days later. The killing of Bassant comes one day after police visited the car dealership that belonged to Sukhdeo and seized several vehicles. The deceased millionaire's dealership was raided on April 20 after reports that two stolen vehicles were allegedly found on the compound. During that seizure, Sukhdeo's widow Rachael, who is Bassant's sister, was arrested and later charged with assault and obscene language. Police said given their information there will be more attacks on people closely connected to Sukhdeo. Reply to "Sheron’s brother-in-law shot dead"